Boffa Miskell and AECOM consulting engineers were appointed by the Selwyn District Council to prepare a Structure Plan in late 2008. This structure plan was completed in August 2009. The project involved comprehensive consultation with local residents and businesses through discussion documents, brochures and public consultation evenings. There was significant public interest and response to the consultation material prepared by Boffa Miskell. Open day events received high attendance and the questionnaire accompanying the Structure Plan brochure achieved a 14% response rate. 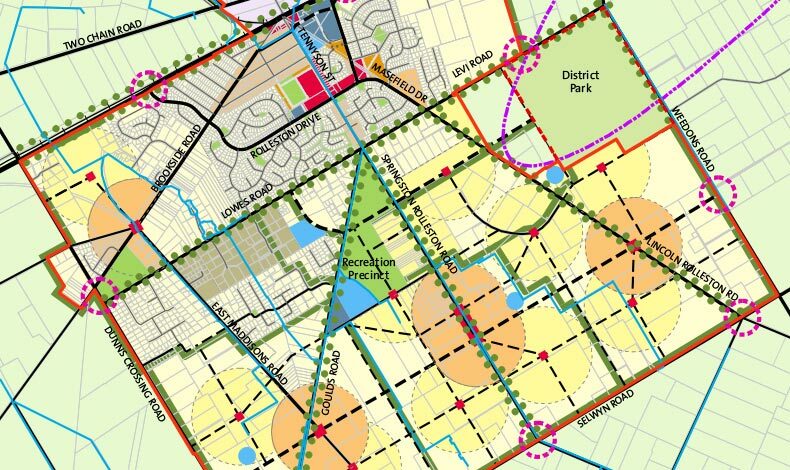 Selwyn District Council endorsed the overarching principles of a design-led and sustainable town, and concluded that the proposals were realistic and achievable. The outcome of the consultation process was a set of principles that were carried through the Plan within the analysis, exploration of options, chosen approaches and their implementation methods. Council considered the Plan easy to read, realistic and well rounded. The Structure Plan also needed to deliver a vision. It considers the future of Rolleston throughout the Regional Policy Statement timeframe to 2041 and beyond this to 2075. The proposals include a refocused town centre; a greater mix of housing to cater for all demographics; a recreation precinct central to the township, (contain a High School, Aquatic Centre and numerous recreation facilities) and a 100 hectare district park. The importance of accessibility to these facilities and other public services from local residences is paramount. The Structure Plan will guide future development in the town and be a reference for further studies to implement its proposals.